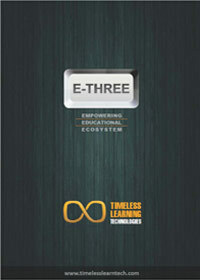 E-Three is a powerful, highly scalable yet easy to use learning management system. A host of customization options along with number of collaboration tools like wikis, blogs, chat & forum enable educational institutes to deliver an interactive learning experience. Integrated Secure Online Exam Module with cheating prevention & detection capabilities makes it easier to conduct online tests to assess the performance of the students. Simply fill up the form and we will send the brochure to your email id.